You are currently browsing the tag archive for the ‘peas’ tag. 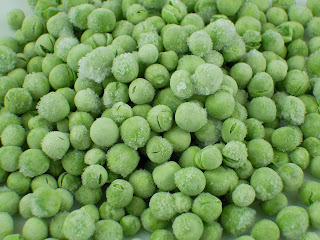 What would mothers do without frozen peas? You’ve just got home, your little one is starving and you’re down to a slice of manky ham, half a Babybel, the usual pasta screws (you never allow yourself to run out of those) and you know you ought to give your little darling some vegetables but you didn’t get a chance to visit the organic greengrocers* in between racing between nursery, bus, train and work [check emails, look busy, munch lunch, check emails, look busy], then train, then bus, then nursery and then home. Not if you live in the back end of arsewhere anyway. Because your corner shop doesn’t stock vegetables seeing as the locals survive well enough on kebabs. But enough digression already. So we grind out the bottom drawer of the freezer (when will you ever have time to defrost that damn receptacle again?) and tumble some peas into a garish coloured Ikea kids bowl (every mummy has a set of these, it’s mandatory), shove it in the micro. Bob’s your gay uncle, you have something resembling a meal without so much as breaking into a sweat. Of course, that’s if your 2-year-old hasn’t yet developed that peculiar aversion to anything ‘green’ which afflicts 75% of all toddlers at some stage or another. In which case just keep a bottle of food colouring handy. Purple works a treat. Or go the sweetcorn route – another sure-thing standby. There isn’t a kid under 5 who doesn’t love the yellow stuff – fact.